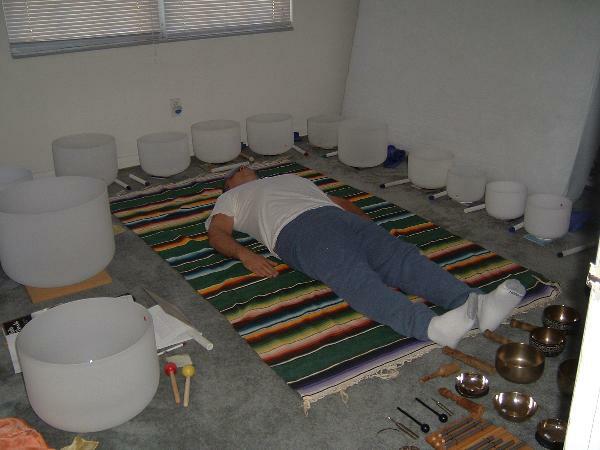 The effect of the sound of the crystal bowls produces a resonance in the body. The alpha waves produced by the crystal bowls stimulates brain waves, both taking on a synchronization of the hemispheres. As a result, the body achieves a state of deep relaxation, ensoñación, and expansion of the consciencesness, which produces a state of well-being and balance. The session takes place comfortably seated or reclining, and consists of: deep relaxation, sonic massage, and harmonization. Each session is dynamic, lasting around 1 to 1 1/2 hours. Each session is unique. One session per week is recommended for optimal balance. A series of sessions with pure tones produces an adjustment, regaining elevated levels of etherial radiation. The sound effect is optimal, because the crystal bowls are made of quartz and silica that act like an oscillator, amplifying and transmitting pure tones. This is the reason pure quartz crystals are used in most computer systems. As well as transmitting energy to the client, the crystal bowls transmit energy toward the sky, filling the aura of the person with the power of light. Each crystal bowl is made of 100% quartz. Since there is a natural affinity toward the quartz in our body, the pure tones vibrate in our body. The quartz crystal music maintains the vibration of white light, that is refracted into the rainbow, and directly acts on the 7 chakra centers. These tones have the power to produce a positive change in our consciencesness. Thus as our understanding expands, we approach more ourselves and we begin to reflect this radiation, or elevated energy in our physical form. The physicists know that quartz is able to maintain the balance of electromagnetic energy between the North and South poles, being a key for time uses. The same electromagnetic field exists within all living beings. Quartz balances our own electromagnetic energies. The quartz bowls are even more powerful because they can be programmed as with any crystal. They are holographic forms, able to contain, to transmit, and to receive thought and intention. Nothing can be created, at least that is what was previously thought. The power of our intentions serves to create our own reality. When we use crystals to harmonize, the crystals amplify thought that has been programmed. This property is used to produce or remove special feelings and qualities in people, and simultaneously release and replace thoughts that are not elevated for some. Methods in addition to energy harmonization include guided therapy with crystal, traditional meditations, and color balancing, or reiki with colors. The patient remains fully dressed and has the option of being seated or reclining.